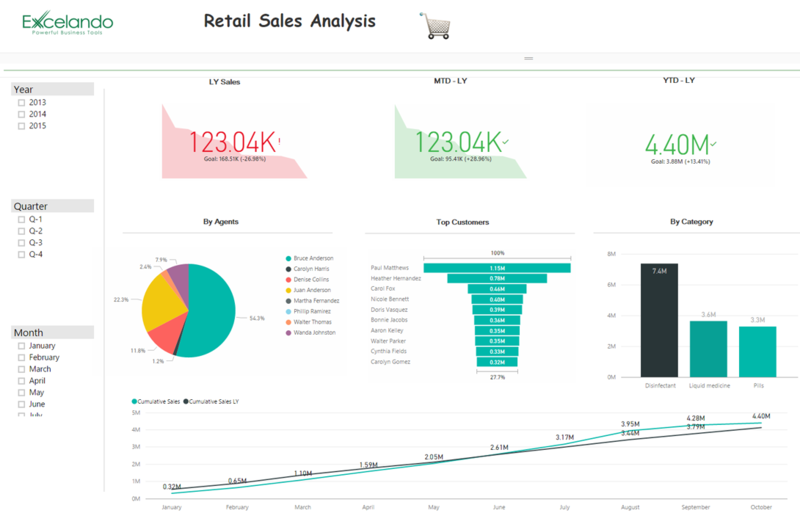 Sales B2B demo using Power BI: Analyzes business KPI and sales in order to evaluate factors that are crucial to the success of the organization. Excelando provides a modern BI solution that brings the organization's reporting and analytical capabilities to new levels. 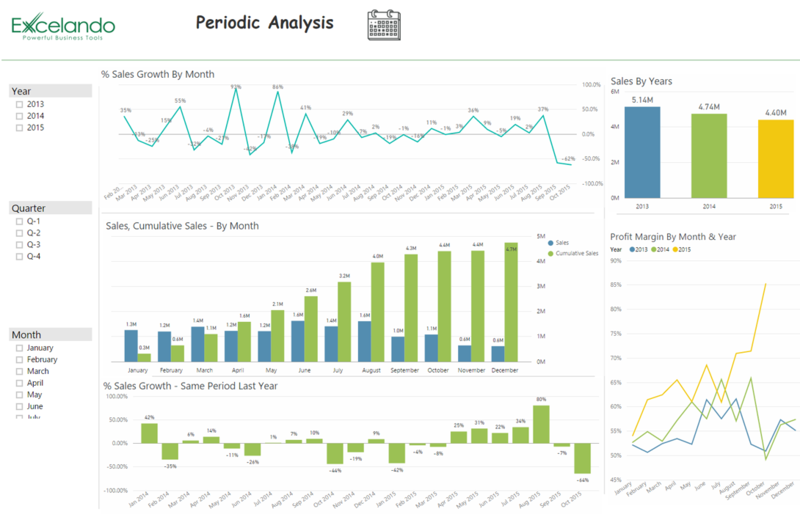 This Power BI Sales B2B demo analyzes the data of a Medicine Company. The periodic analysis focuses on trends and period-over-period performance comparison, as well as customer preference, sales and products reports. The tools used in these reports enables the client to spend less time searching for information, while providing a better business understanding and a multi-dimensional drill down of data and performance. The client is better equipped to make business decisions, easily and wisely. This natural and affordable environment is accessible from both office and mobile, and most importantly: all the information is in one place, clear and up to date, without the need for servers, software or experts. 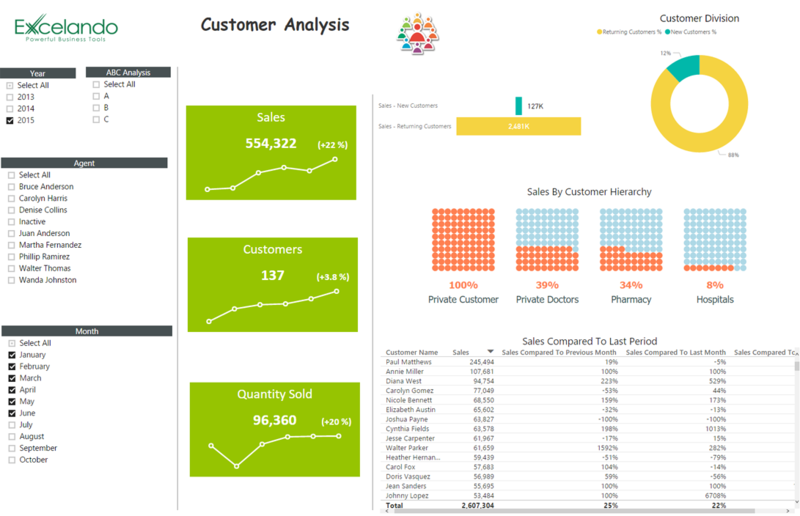 This Power BI demo solution can have a profound and positive impact on the company's sales. The solution is updated in real-time, eliminating the need to compile and reproduce reports. Executives use their mobile devices to quickly comment and share information with other employees and managers, resulting in higher customer satisfaction and reducing operational costs.Excelando provides insightful, real-world guidance to help its clients elevate organizational performance. Excelando's team work closely with clients to deliver exceptional value and the best possible total cost of ownership of solution.